Kali Katerberg/Daily Mining Gazette Ontonagon residents, board members and state officials gather for the first Project Rising Tide meeting. 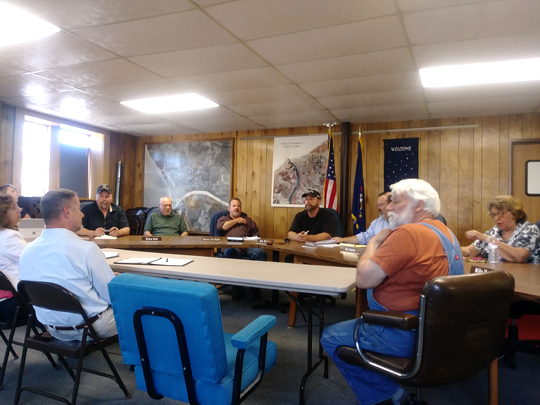 ONTONAGON — Brainstorming a Project Rising Tide game plan, members from various councils and boards joined Michigan representatives in holding their first meeting Thursday. The village kicked off the project in early May with a visit from Gov. Rick Snyder who welcomed the village of Ontonagon to the second round of communities involved in the program. Project Rising Tide assists selected communities in economic development using planning and increased assistance through the Department of Talent and Economic Development (DTED). The idea has community leaders working through difficulties with guidance in a “let us help you to help yourself” format. Communities remain in the program until their graduation when they go on to help others. The first steps will involve creating a community vision with input from local stakeholders like businesses, young people and church groups on local priorities and challenges, said Jennifer Tucker from the Michigan Economic Development Commission (MEDC). The idea of incorporating student suggestions was particularly well received. The previously created small harbor plan was mentioned as an area with a lot of information from locals to build on. “Generate all the ideas you can,” said Joe Ericson, village manager. The meeting attendees left with different bits of homework for the next meeting including adding to a master list of suggestions to prioritize from on a later date, scheduling student input, publishing the small harbor plan, review of a DDA survey for business owners and locating other community members to regularly involve in the process. For future Rising Tide developments, the meetings will be held the last Thursday of each month at 4 p.m. in the Village Council chambers with the next one on July 26. These meetings are open to the public for involvement and comment.